It is the policy of the nursery to give a warm welcome to all children on their arrival to nursery. We try to play music in the hallway for the children to feel like they’re entering a home from home setting. Entrance into the Nursery is secure with a video intercom system installed allowing for nursery staff to speak to visitors/parents through the video screen before allowing access to the nursery. Staff can access the nursery by entering a secure code into the keypad system. Only authorised personnel have knowledge of this code. Parents and visitors must knock on the door and wait for the door to be opened by key members of staff. Please stand in front of the camera so members of staff can see clearly identify who is collecting children before opening the door. Unauthorised persons are not permitted to open the rooms to anyone at any time. There is an Ipad on the front desk with a visitor app on. All visitors will be signed in and give their registration number and identify the purpose of their visit. All children are to be brought into their main room by the person who is responsible for them upon arrival (parent/guardian), not left in the reception area. The person dropping off must make the room staff aware of their arrival. The person dropping off should place the child’s belonging in the appropriate places. Both the person dropping off and the staff member will then spend time exchanging information. This information will be used to assess the child’s day. Are they in good health? If not what are the problems? Who will collect them at the end of the session? Have they had medication in the past 12 hours? If yes what? The arrival and departure time of each child will be recorded on the registers. Any specific information provided by parents should be recorded and passed onto the relevant member of staff/key person. If a child has an existing injury, bruises, bump etc… Parents/ carers have a responsibility of informing staff of this when dropping the child off and should complete a pre-existing injury form. Collecting children from Nursery is in principal the same as for arriving set out above for entering the nursery. After granting access to a parent or visitor, members of staff are then responsible for ensuring the conduct of such persons and that appropriate access to children is allowed and supervised. Parents must arrive in good time to ensure collection before the session end or closure time. Parents arriving late at the end of either session will incur a late collection fine of £10.00, for the first 10 minutes and £5.00 for every 5 minutes thereafter which is revised periodically. Parents will be given feedback about their Childs time spent within nursery and the children will be signed out on the registers by the manager or person in charge. Upon registration parents must provide names for persons other than themselves to collect their child, at least two named persons are required and full contact details are required in cases of emergency. Children will only be released from the care of the nursery to individuals named by the parent and recorded on their relevant entry record. 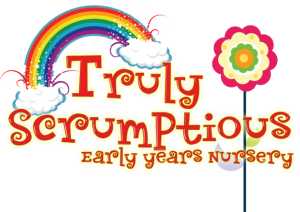 Truly Scrumptious Early Years Nursery operates strict arrivals and collection procedures. The parent must inform the nursery without delay that they will not be able to collect their child. To help checks identify the manager or person in charge will call the parent back to discuss the details given by that of the person wishing to collect a child. A unique password set between parent, collector and Nursery must be used and received before handing over a child into their care. The parent must ensure that a *suitable person will collect their child in their absence. *suitable persons must be over 16yrs old and be capable of caring for the child in the absence of the child’s parent. If the Nursery is unable to identify the person with the details provided by the parent, unfortunately the Nursery will still not be able to release the child from its care.